HTC to unleash 16MP Windows Phone 7 handset? Now here's a rumour that's come out of nowhere: HTC could be working on a 16MP Windows Phone 7 handset. The apparent evidence is a video posted by mobile news site PocketNow, in which a line-drawn bunch of party-goers turn into real live high definition people when snapped using the camera phone. But we're not overly convinced, and here's why. Firstly, where has this video sprung from? PocketNow doesn't say where it found this mysterious Aha tribute video and it's not exactly difficult to knock together such a thing in this internet-savvy day and age. Secondly, HTC has never before shown an interest in competiting in the digital imaging race; its highest megapixellage to date is 8MP, so why leap to 16MP? And surely a quality manufacturer like HTC knows it's not just about the megapixels; without a good lens and decent quality sensor, all those extra megapixels are nigh on pointless. The technology does exist to facilitate a 16MP camera; Qualcomm has a quadcore chipset that could support up to 20 megapixel cameras but such a chipset would no doubt push the price sky-high. However; we won't rule the possibility of a 16MP HTC phone out altogether. 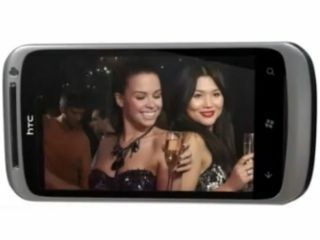 After all, it's tough to differentiate yourself in the tightly controlled Windows Phone 7 hardware market, and the handset in the video does look quite a bit like the recently-leaked HTC Mazaa. But imaging is where Nokia has shone in recent years - with the Finns racing to get into the Windows Phone market could we see a whole new megapixel war about to begin?